“Also seized were the gambling apparatus and cash amounting to RM1,744,” said Poge in a statement today. 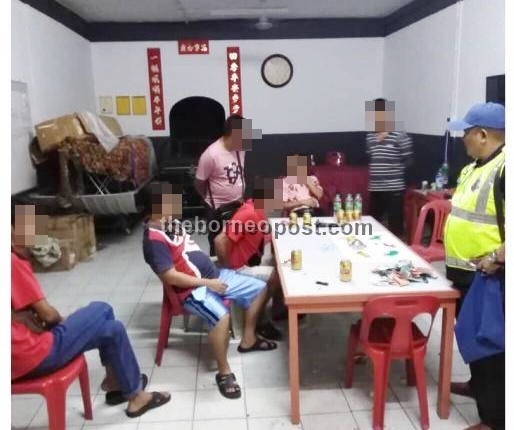 KUCHING: A group of six men were arrested by the police for gambling in an office belonging to a school management board in Buso, Bau at around 10.45pm last night. He added that the raid was carried out after the police received numerous reports about the illegal gambling activities by members of the public. All six suspects aged between 32 to 51-years-old will be investigated under Section 7(2) of the Common Gaming Houses Act 1953. The suspects who were arrested for illegal gambling. “During the raid, all six suspects were still in the midst placing their bets on a piece of cloth adorned with animal images,” he added. Bau district police chief DSP Poge Nyaon said all six suspects were in the midst of playing ‘holo’ – a dice based gambling game – when the raid was carried out.